The Strauss Institute Conference, which took place on Wednesday, discussed the promotion of a balanced lifestyle among teens. Research grants were awarded to food industry researchers. The Strauss Institute has been active since 1998, and is the realization of the vision shared by Raya Strauss Ben Dror and Michael Strauss: the promotion and broad dissemination of knowledge and information on living a healthy lifestyle. This year, the Institute celebrated twenty years of activity at the Group’s head offices, at a conference featuring a variety of lectures on subjects related to a balanced diet followed by roundtable discussions with the aim of promoting a balanced lifestyle among teens. 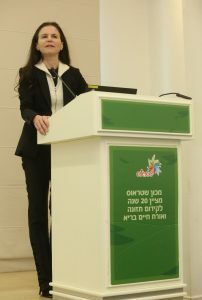 The conference was opened by Ofra Strauss, who emphasized the importance of the teenage public, which attended the event and participated in the roundtables, making themselves heard, and that Strauss Group is open to criticism, which it views as constructive. Strauss Israel CEO Eyal Dror presented the elements of Strauss’s activity designed to promote a healthy lifestyle, which are drawn from Strauss Israel’s strategy – working to educate people to consume balanced meals, clear labeling and maintaining a dialogue with communities. The Strauss Institute awards research grants to researchers in the food industry, and in the twenty years since its establishment 3,400 scientific articles have been published and 44% of grant recipients have been appointed as professors. In the second part of the Conference participants formed a number of roundtables, facilitated by Dr. Eyal Doron, and spent ninety minutes discussing solutions for making healthy food available to teens. One of the roundtables included 14 and 15 year-olds, who raised problems – and solutions – associated with what they consider the right way to raise awareness of a balance diet among this age group.